Please participate in one or more of the ways below to ensure that the Sesquicentennial celebration is memorable and successful! See the tabs below find ways to participate in Howard's sesquicentennial celebration. “The Time is Always Now”, is the theme for this year’s sesquicentennial events. For Howard, these are the moments when we overcome challenges, recognize opportunities and build the future. With this, we ask for students, alumni, faculty and staff to submit memories and quotes reflecting upon this theme for a chance to be featured in this heart-warming campaign. Those that would like to be featured should submit their Hi-Res Candid, or Headshot photo, and quote to 150years@howard.edu with #HowardU150 in the subject line to be considered! Senior students and Alumni are encouraged to develop a video and/or retrospective letter to their college self. The video or letter would describe the feelings, advice and lessons learned from their previous years. This video should demonstrate the growth you have achieved as a proud Bison and your future aspirations. 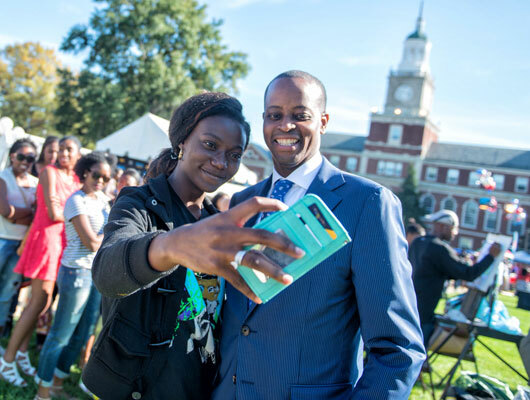 Use #HowardU150 to share on social and tag @HowardU on Twitter & @Howard1867 on Instagram to be considered. Winners will be announced March 1st, 2017. We are requesting contributions of important facts about Howard, both historic and current, as well as ideas of potential Sesquicentennial events from the University community. To ensure that your ideas are included , please submit your event by March 2, 2017. Please note, event suggestions will continue to be reviewed after this date. We look forward to your input, as we embark on this exciting journey to celebrating 150 years! For general inquiries, please use the 150th contact form. See the 150 Calendar page for a list of events and details. Donate to various Howard funds to help ensure the success of our institution and students during this 150th year!